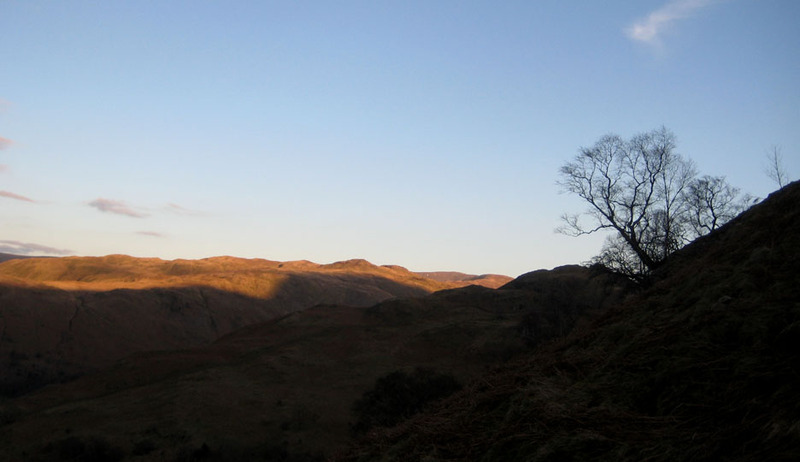 " Arnison Crag and Birks "
Date & start time: 1st March 2011, 2.20 pm start. 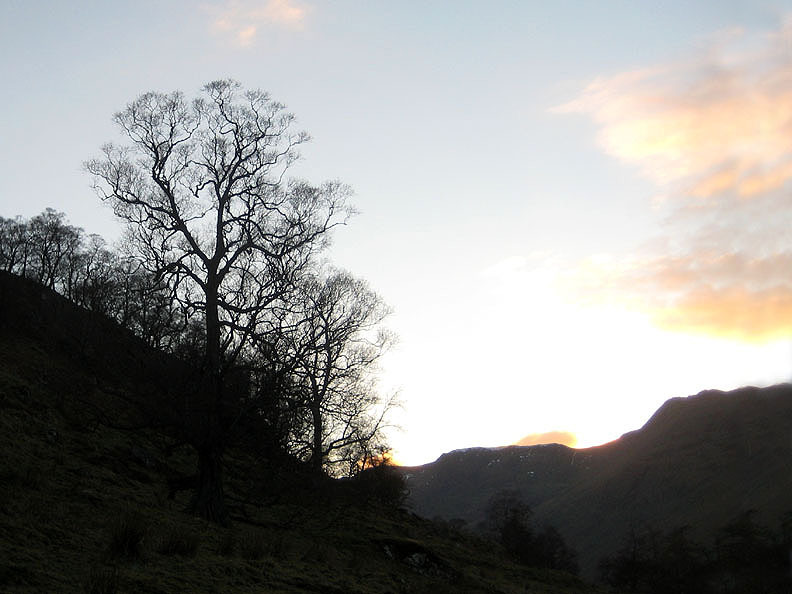 Places visited : Oxford Crags, Arnison Crag, Trough Head, Birks, Glenamara Park and back. 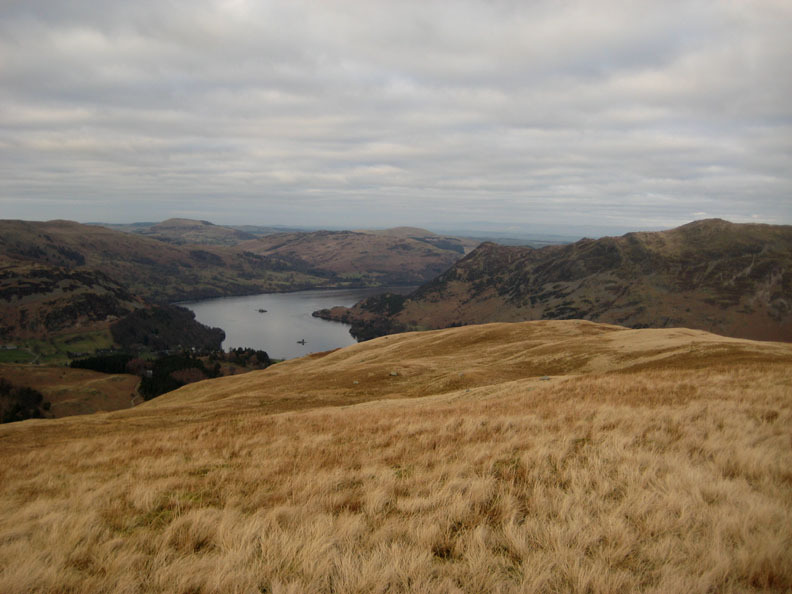 Walk details : 4.1 mls, 1750 ft of ascent, 3 hrs 40 mins. 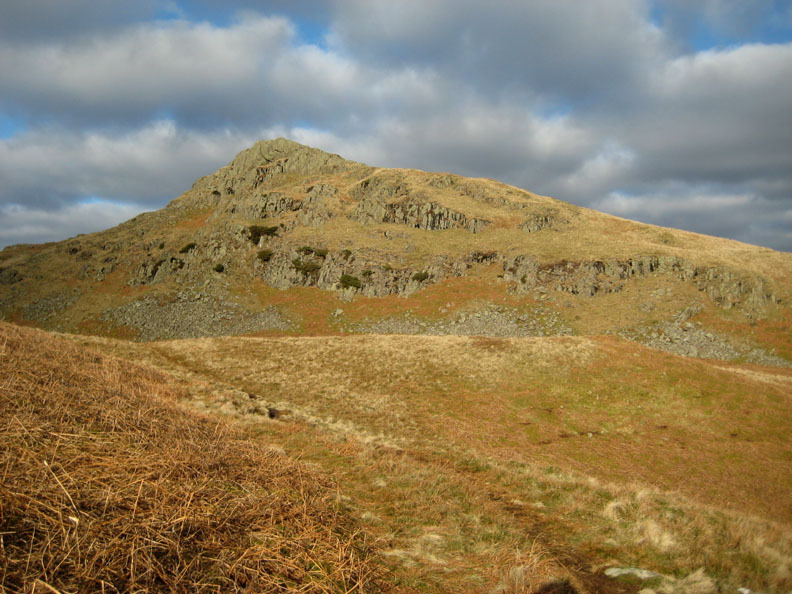 Highest point : Birks Fell, 2,040ft - 622m. Weather : Overcast to start but clearing to blue skies by sunset. Warm to start, ending cool. 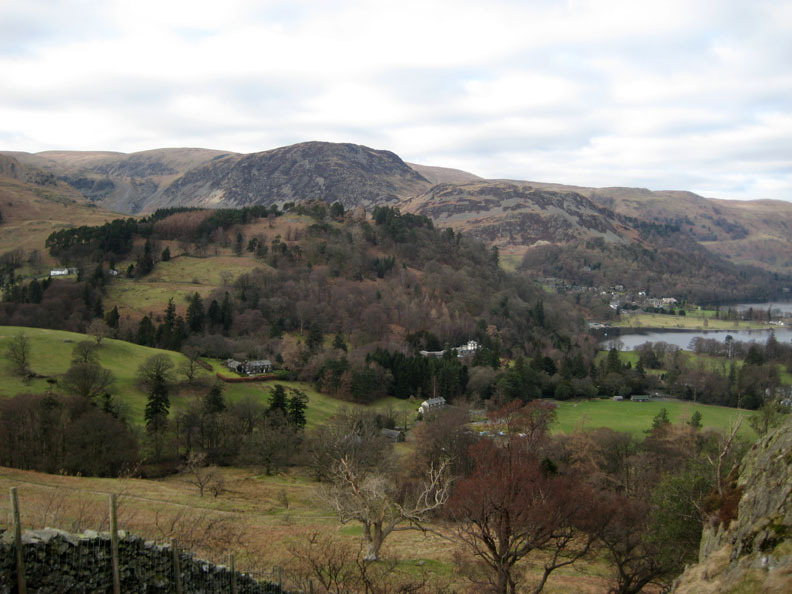 so we packed a small bag, put the dogs in the car and took the opportunity to go for a walk in Patterdale. 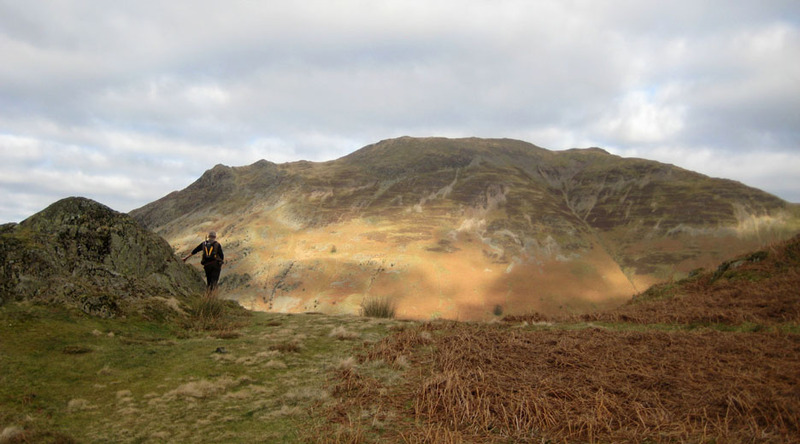 Today we climbed two more of our outstanding Wainwright fells from our slowly reducing third round total. We haven't been up on Arnison and Birks since September 2006 . . . doesn't time fly ! 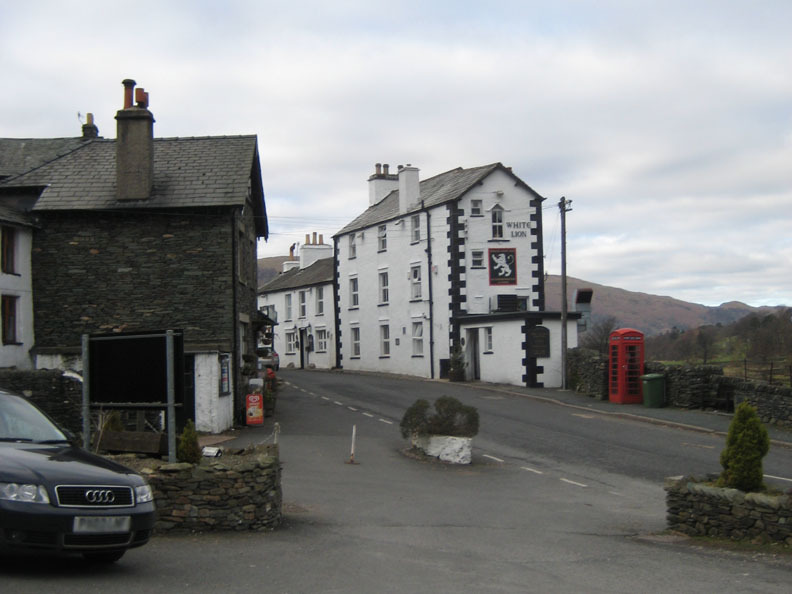 The White Lion in Patterdale at the start of the walk. 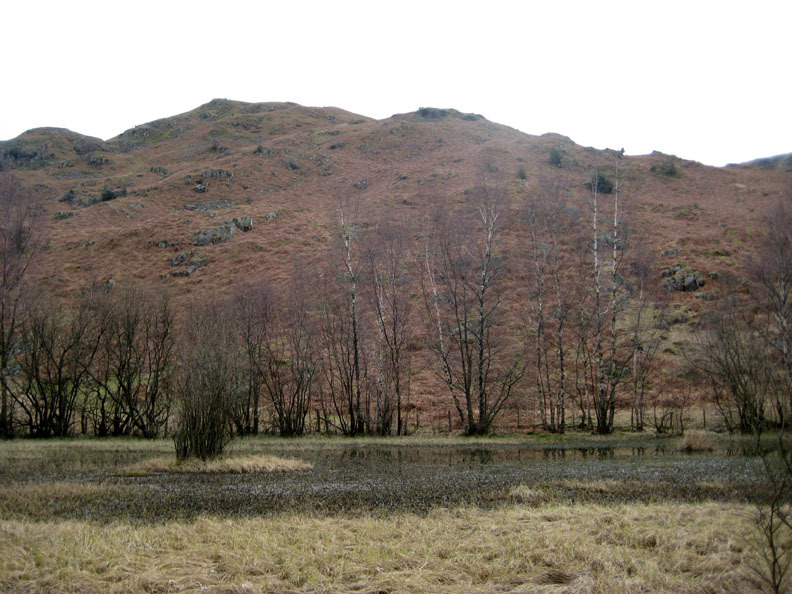 Walking the track up from the pub and around the back of the Patterdale Hotel we pass this small, shallow tarn. Wainwright first described it as a bit if a tip, full of rubbish, but it is certainly looking nice now since it has been tidied up. 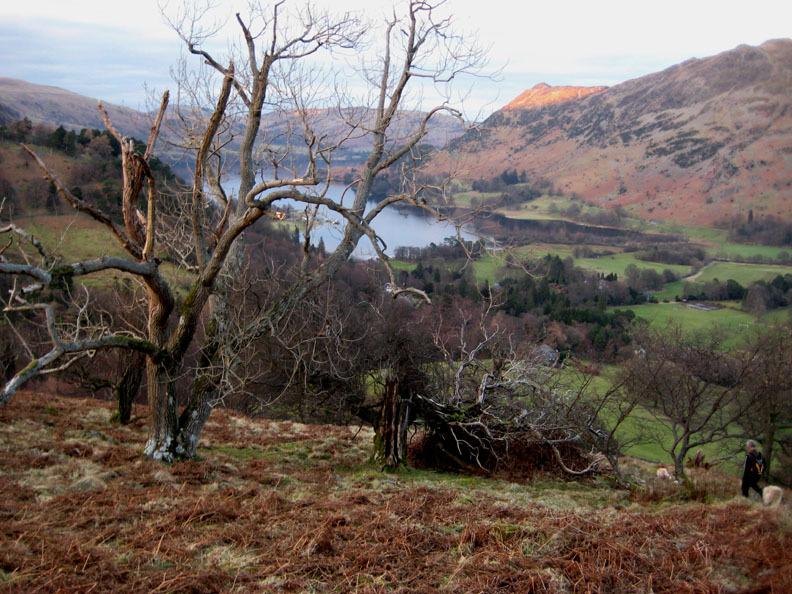 Looking back above the tarn we get a good view of Place Fell across the valley. 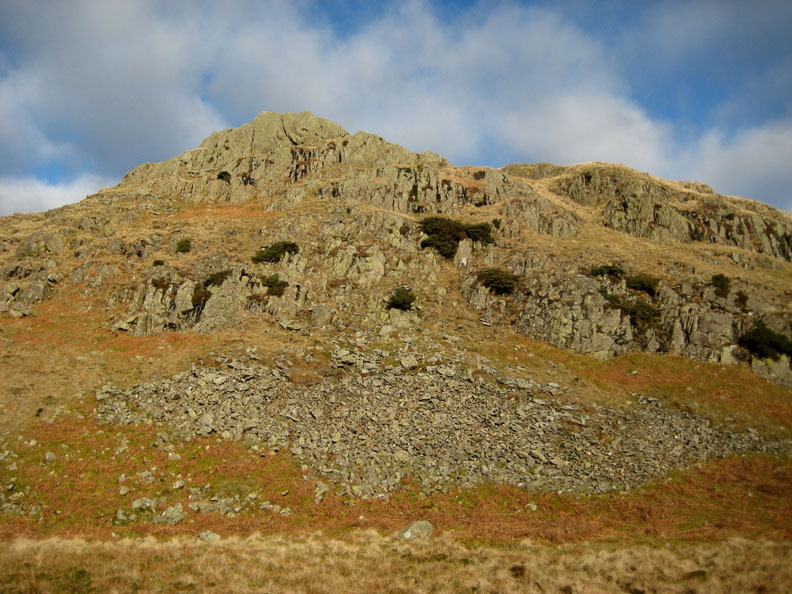 and at this group of aspiring young rock climbers heading for Oxford Crag on the right. 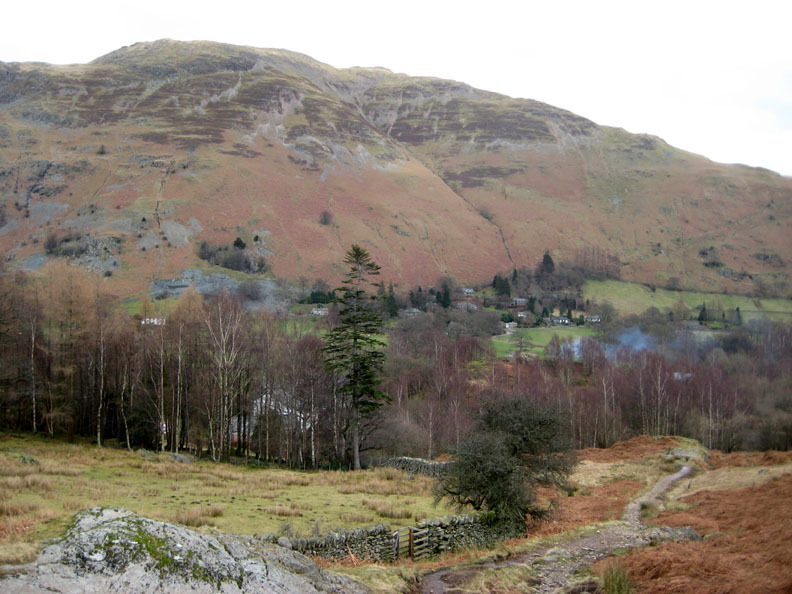 and to Patterdale Hall, normally not seen from the main road due to the large trees that surround it. 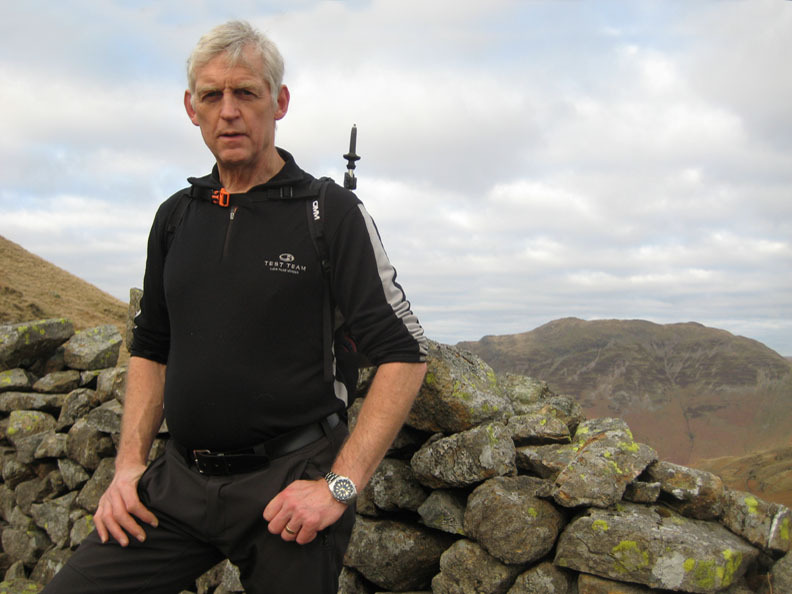 On top of Oxford Crag I pause for a view over to Place Fell again. 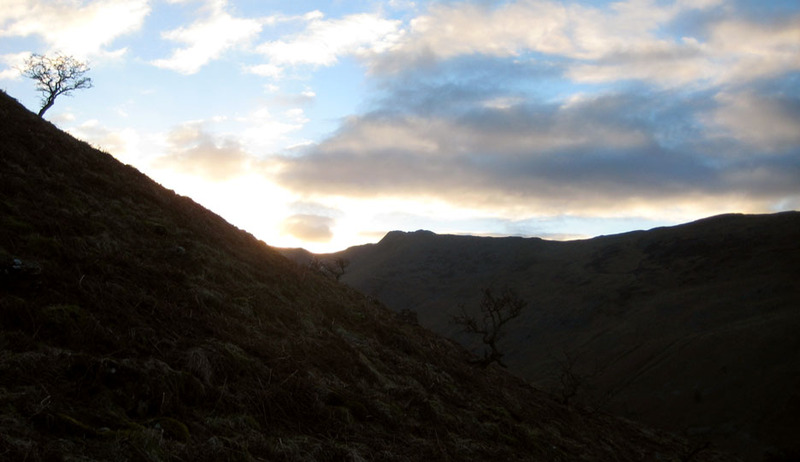 The sunshine and fast moving clouds create lovely patterns on the fells. Onward and upward, the views improve all the time. 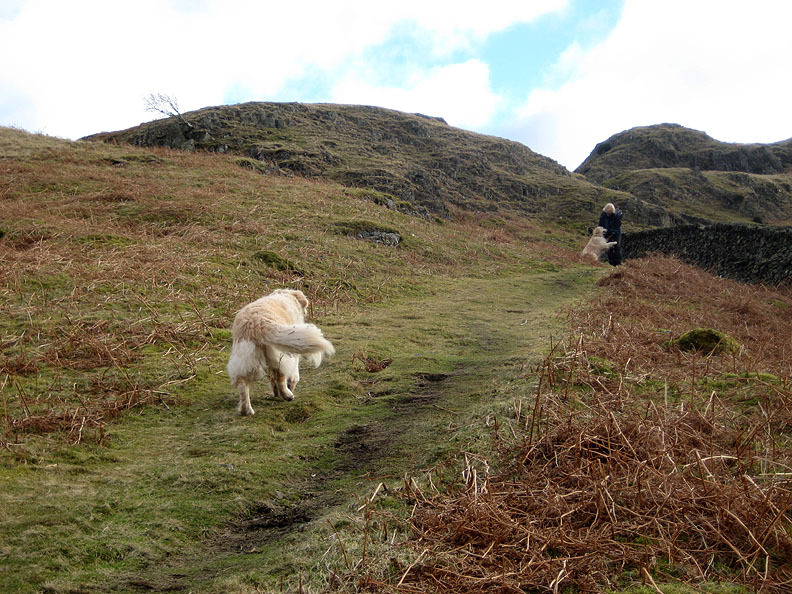 Suddenly the dogs run on ahead and greet an oncoming walker. 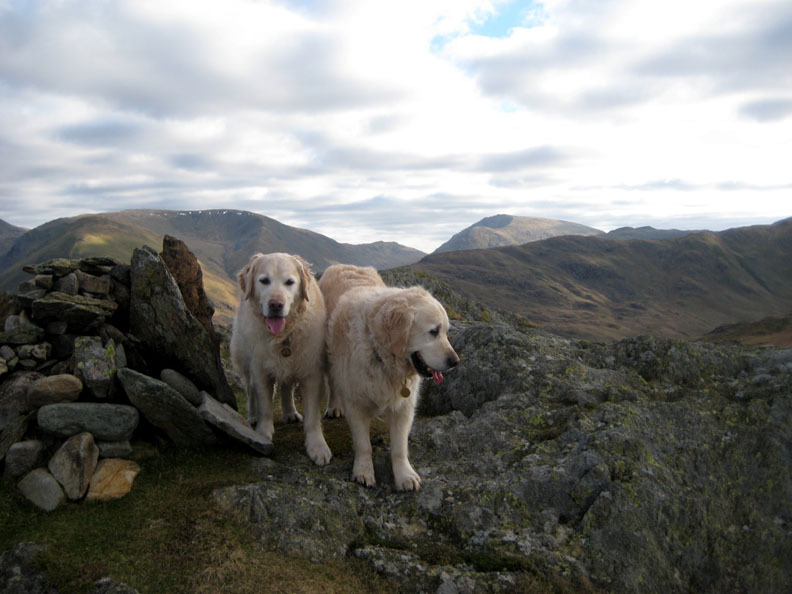 We've walked with Maggie before, but this is the first time we've bumped into her on the fells. 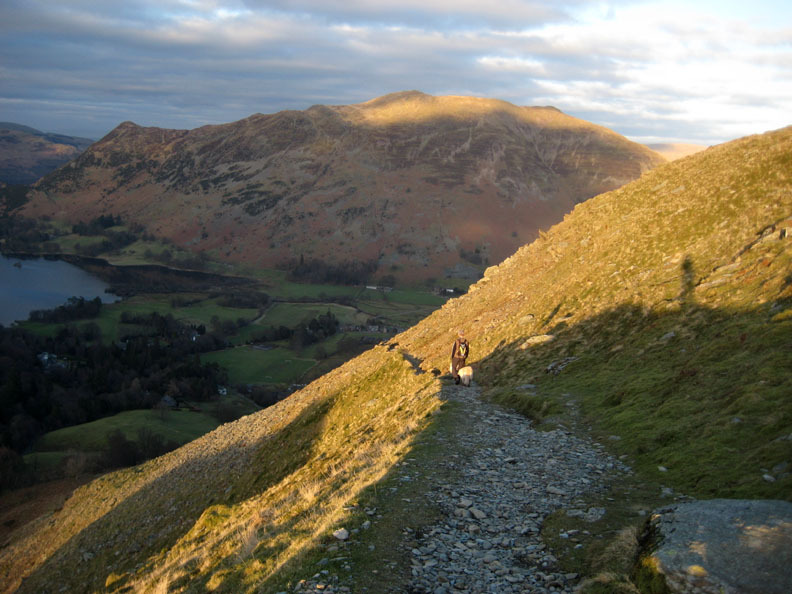 She started much earlier and has already been up to St Sunday Crag and Birks and is finishing her walk back in Patterdale. 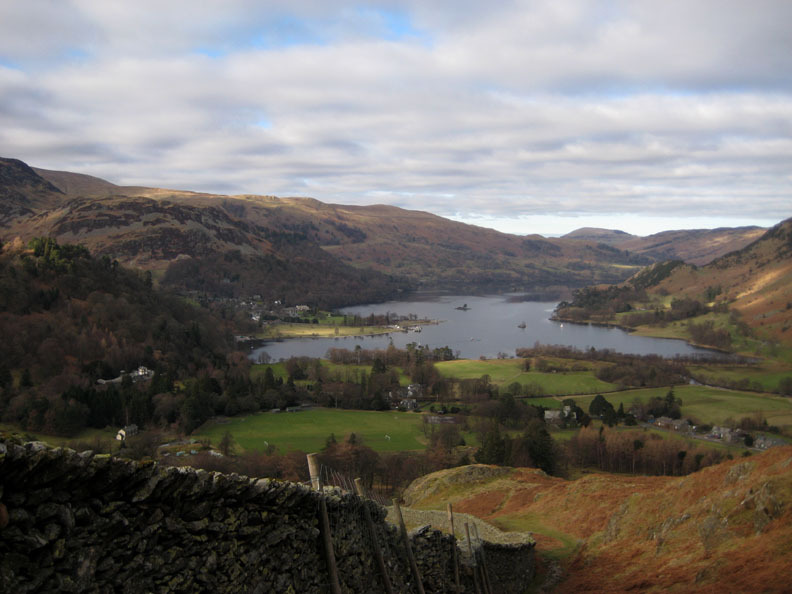 After chatting for a while we take our leave and walk the short distance to the top of Arnison Crag. 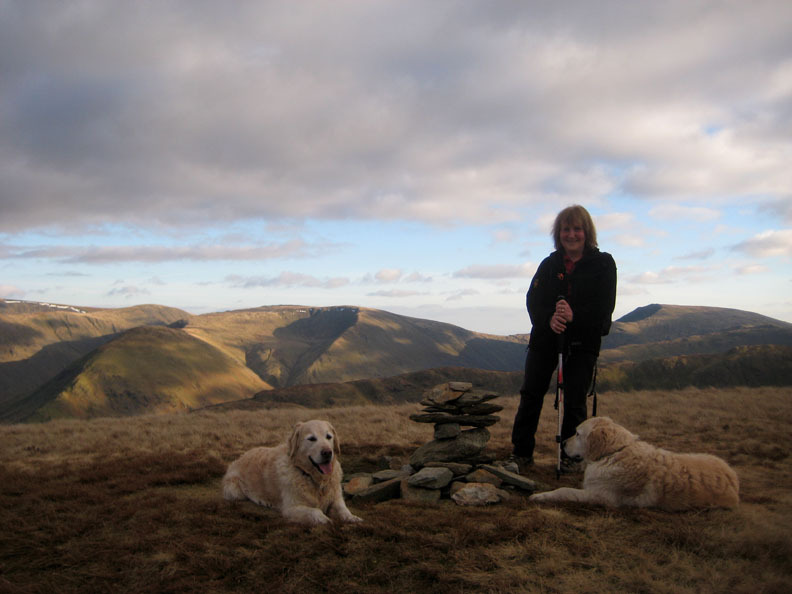 Here we were greeted by a small cairn but a big view. 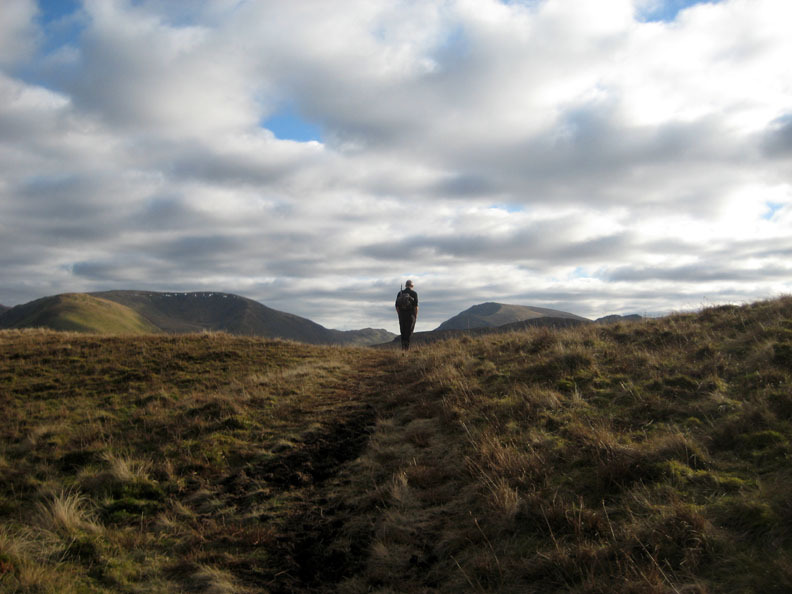 Venturing off across the undulating summit of Arnison Crag. 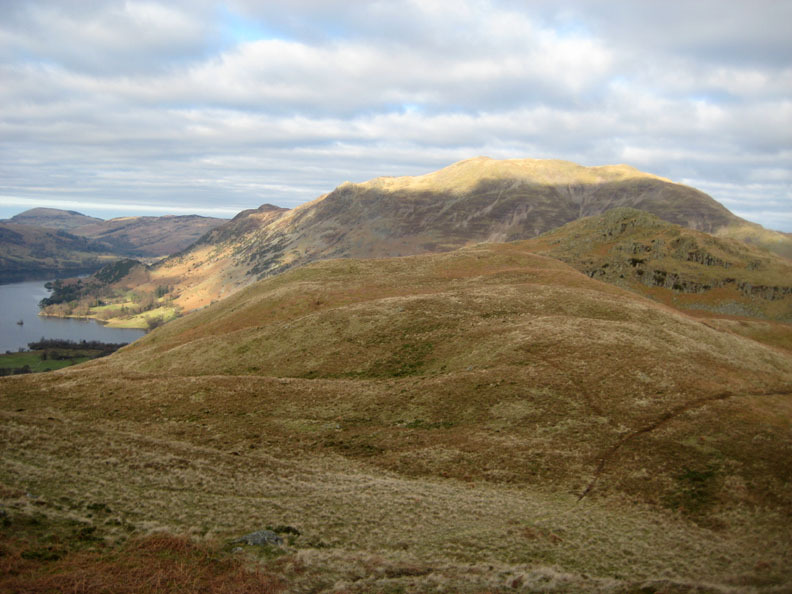 Looking back at the summit, now bathed in beautiful sunshine. Still sunny five minutes later as we walk further away. 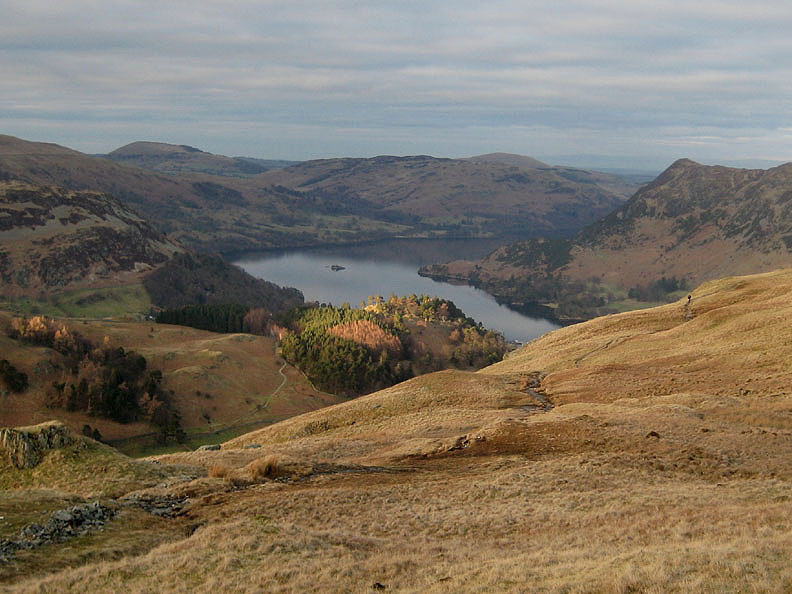 the break in the clouds now illuminates Place Fell behind. 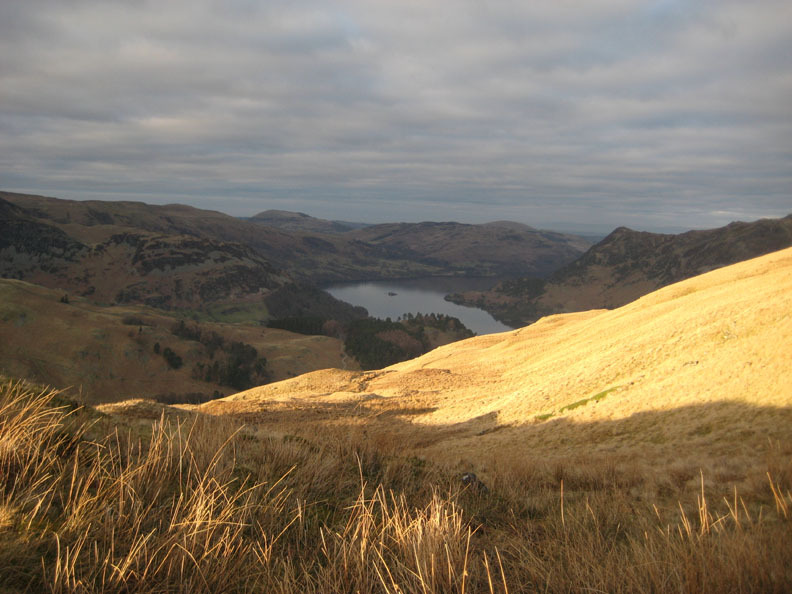 With time in hand now the afternoons are drawing out, we contemplate the next part of the climb . 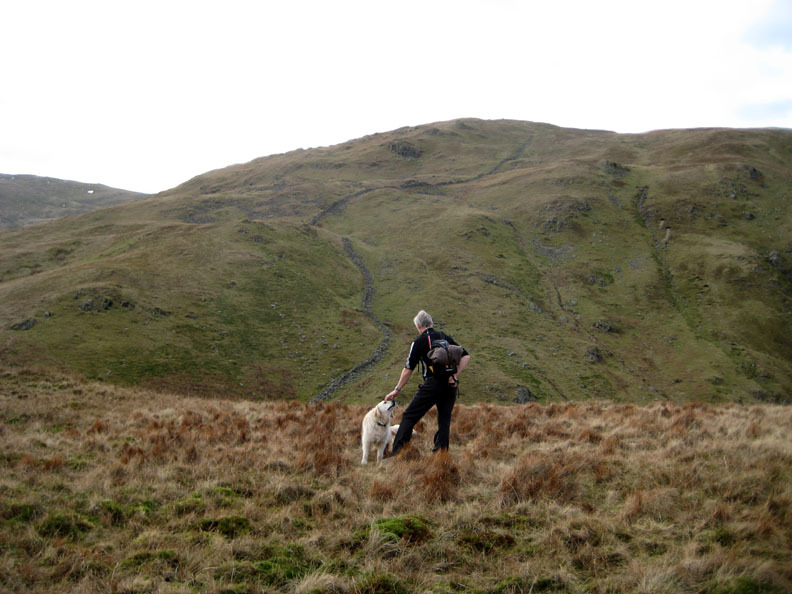 . . up to the summit of Birks. The route finding is simple . . . follow the wall . . . but first we divert left to take advantage of more level ground. 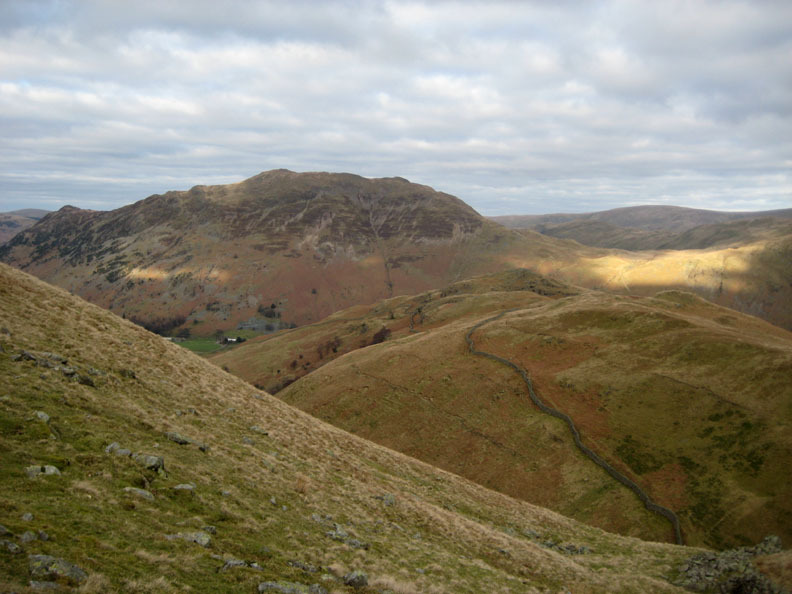 Trough Head, a more or less dry valley at this height, between Arnison Crag and Birks. This marks the start of the steep, final climb up to Birks. 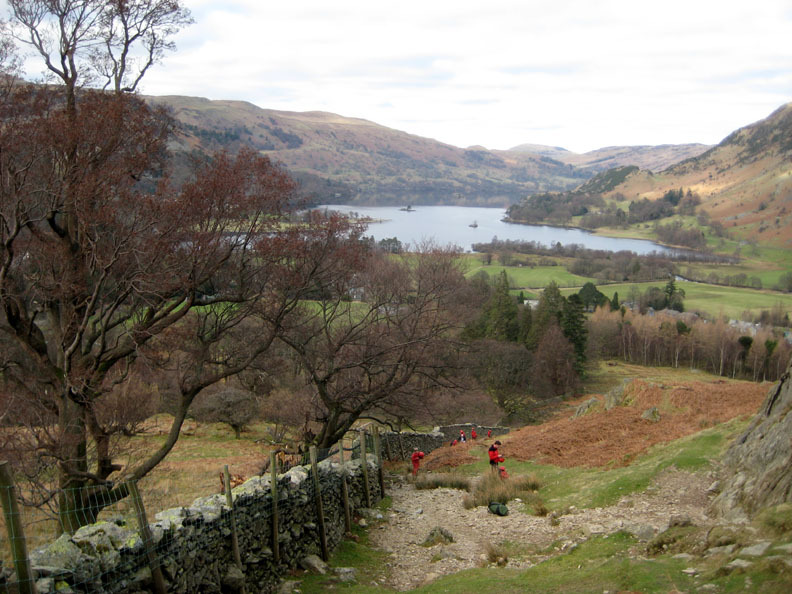 Today we had walked the along the high ground rather than follow the wall lower down on the side of Arnison. 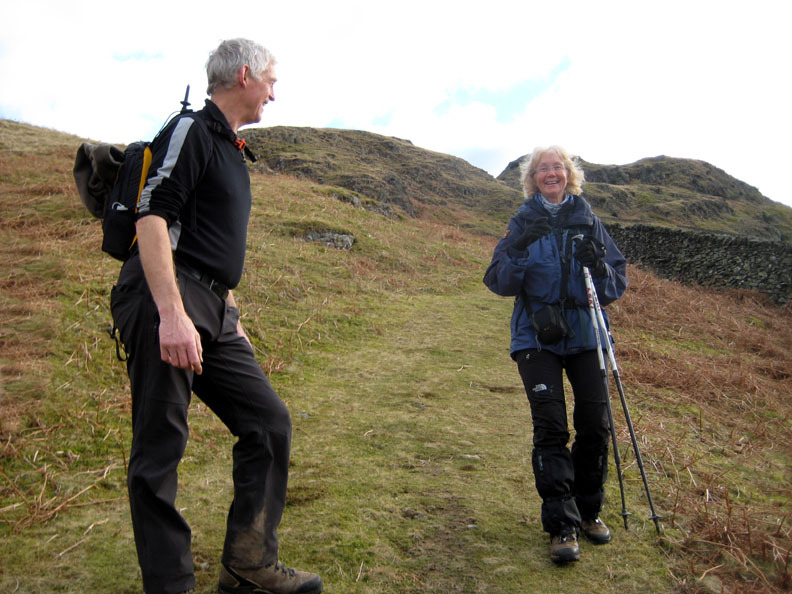 Each route seemed to have a reasonably well defined path but the top route avoided the drop down to Trough Head. She could have said "Stomach in, chest out " before she pressed the shutter. 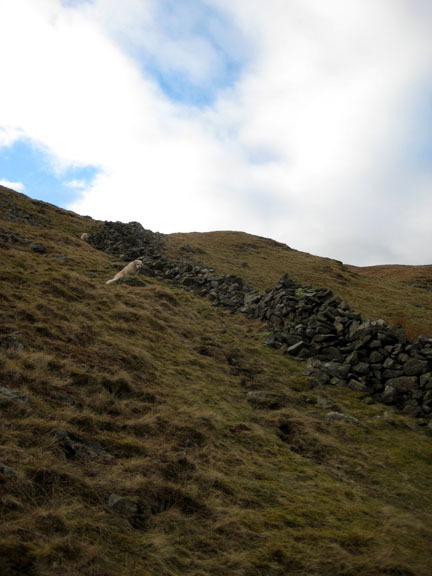 The steep wall up Birks. 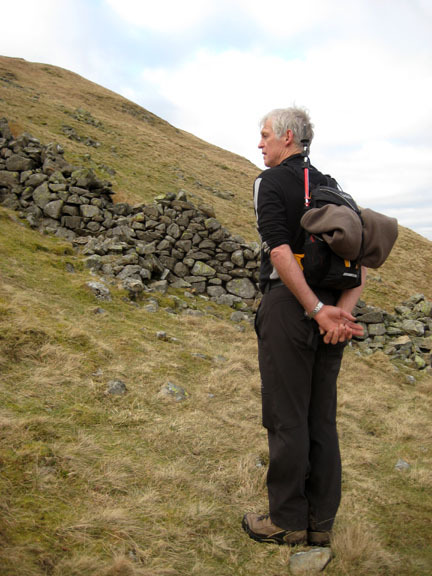 Contemplating the steep wall up Birks ! 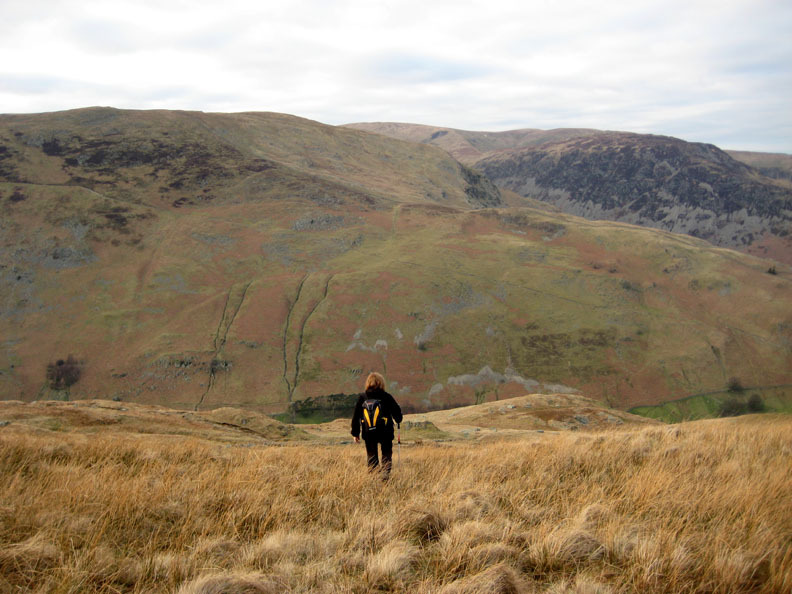 were rewarded by fine views across the valley towards the High Street fells. 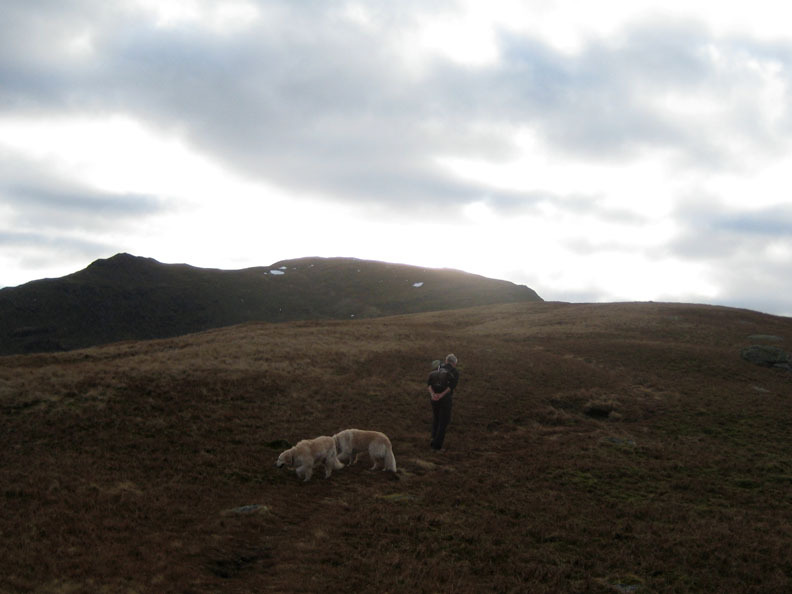 and just a short distance into the sun till we reached the small cairn on Birks. 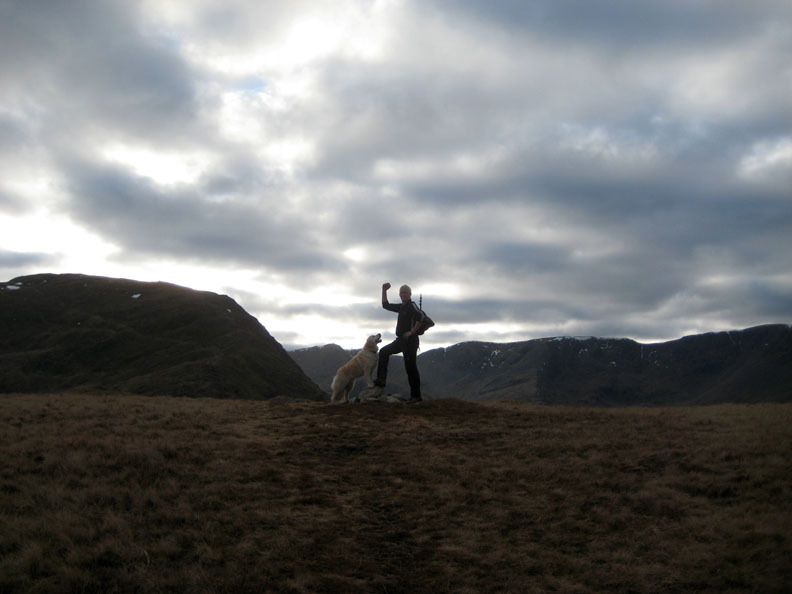 One man and his dog . . . summit achieved. One woman and her two dogs . . . summit achieved. She's obviously more popular than myself . . . or perhaps she has the bag of dog treats handy ! Overcast again as we set off from the summit. 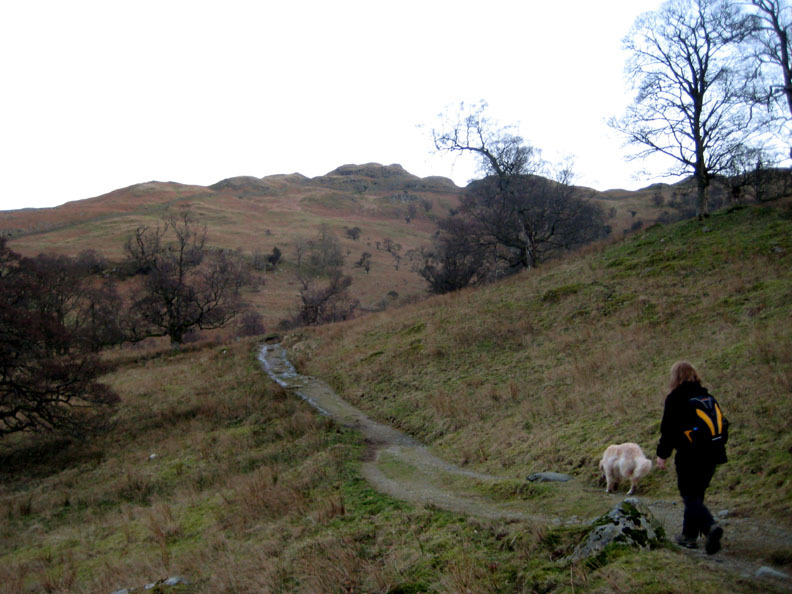 Heading towards the St Sunday path in order to follow it back to down to Patterdale. looked more like a small hut or shelter, a summer sheiling, when we got up close. 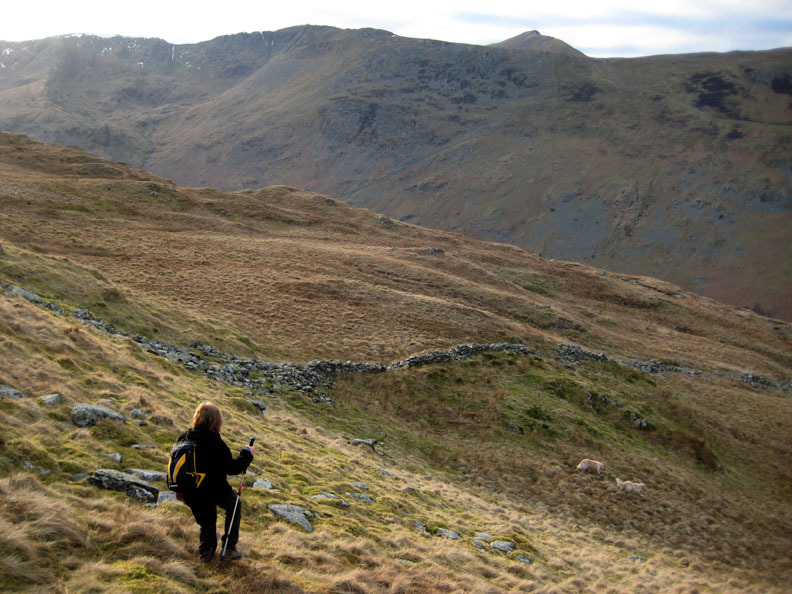 Catstycam again but High Spying How hides Striding Edge from view. 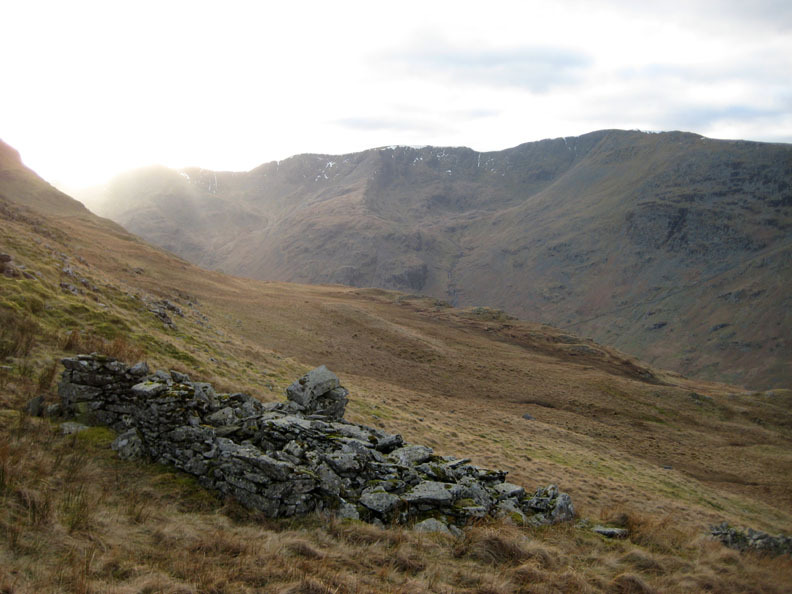 There was a small cornice of snow on Helvellyn and Nethermost as can just about be seen here. That's better . . . someone turned the light on. A few minutes later the sun had moved on and now just highlights the top of Keldas. 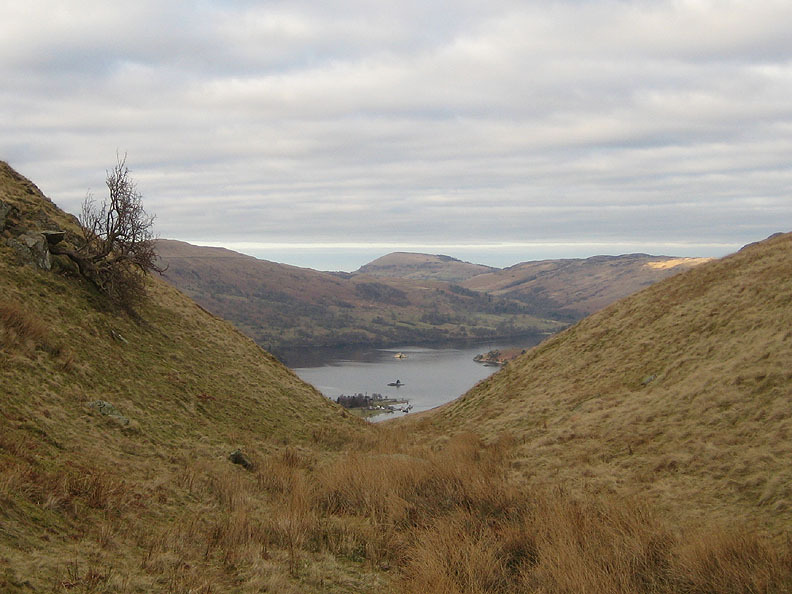 The Patterdale path cuts a notch out of the side of Thornhow End. but Angle Tarn Pikes still manages to keep its head above the dividing line. The sky has cleared nicely but the sun is setting fast. Down through the trees at the head of Glenamara Park . . .
. . . some of which are looking in a bit of a poor state due to their age. All that remains is the 3/4 of a mile walk back through the old park. Conveniently placed at the end of the walk . . . the White Lion . 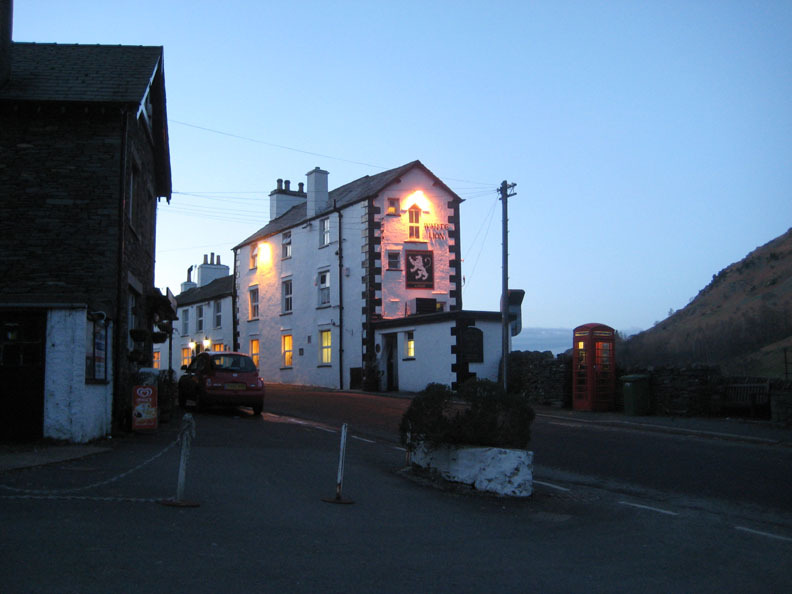 . . top pub ! Top refreshment on offer too . 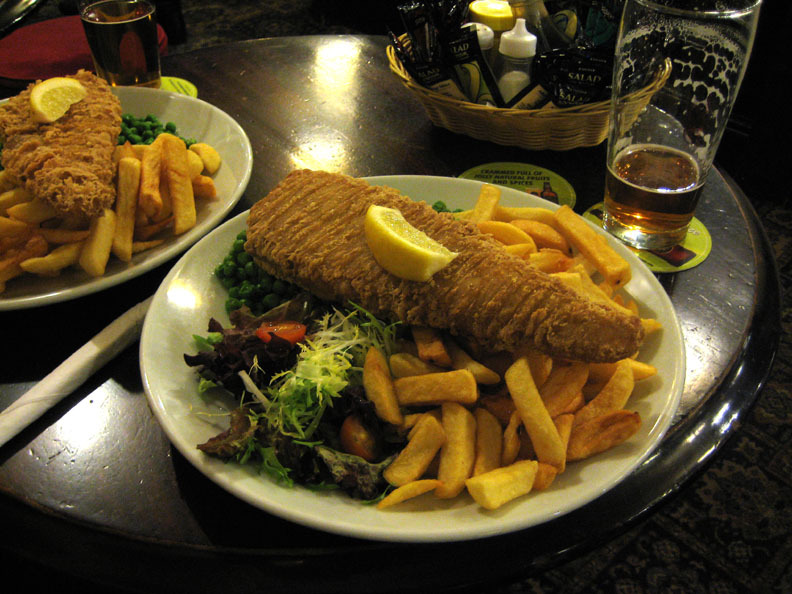 . . the simplicity of fish and chips . . . but served with style ! Technical note: Pictures taken with Ann's Canon 75 digital camera. This site best viewed with . . . a classic meal at the end of the walk. Previous Web Page - 17th - 19th February 2011 Tethera Play 2011 "Party Piece"